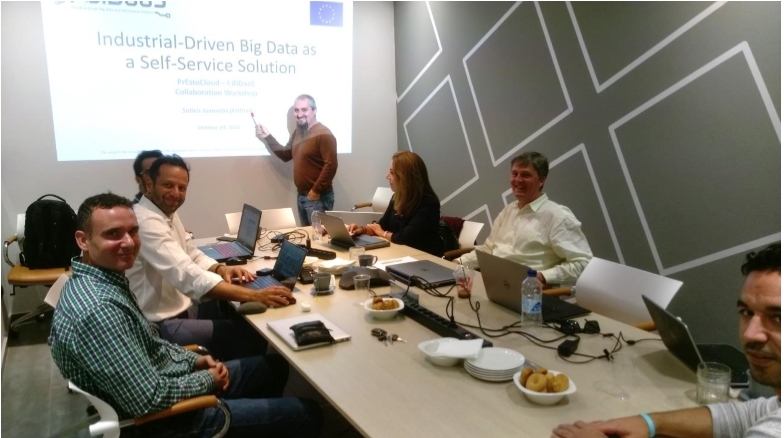 On October 29, the two H2020 projects PrestoCloud, and I-BiDaaS, organized a common workshop in Athens on the premises of Ubitech. The aim was to discuss common technical aspects and challenges of the two projects and also to prepare the grounds for further collaboration activities. The first meeting was about getting to know each other with general presentations. But the essential core of the workshop was to work out the common challenges and scopes which offer the opportunity to collaborate. Since the PrEstoCloud project started one year earlier than I-BiDaaS, many of the technical aspects are designed now and prototypical implementations are available. Many useful hints regarding edge and streaming analytics were shared and helpful products discussed like Tosca, FaaS paradigm, JPPF framework and lemonade. The EU General Data Protection Regulation (GDPR), which was enforced in mid-2018, led to a longer discussion. Both projects use customer data. In PrEstoCloud it is not made public, and in I-BiDaaS a data fabrication platform from IBM is used to get along. An essential point discussed was how to continue the collaboration and cooperation, e.g. regarding dissemination: PrEstoCloud will participate in a workshop in Japan next year and invited I-BiDaaS to submit proposals. Also a cooperation regarding social media channels and newsletters was agreed on. With the workshop we explored new paths as a great opportunity to collaborate on many aspects and ensure greater impact by leveraging each other’s communities and results.